InterContinental Mar Menor Golf Resort is located on the doorstep of Mar Menor Village golf course and offers world class facilities. This 5-star resort is ideal for golfing holidays and short breaks. Golf Packages at Mar Menor include free golf transfers to each of the 6 Nicklaus Design courses all located within a 45 minutes’ drive. The Murcia Golf Trail includes the European Seniors Tour venue, El Valle, and Alhama Signature Golf - arguably the finest of the Nicklaus courses in Murcia. Upgrades to Unlimited Golf programmes are available on request. InterContinental Mar Menor is perfect for groups, with Free Murcia Airport Transfers, Free Group Leader & Free golf buggies! Semi All-Inclusive packages are also available on request with Ascot Golf. Specialist restaurants include Nomad, serving buffet breakfast and Mediterranean evening meals, La Fontana di Pietra offering a variety of Italian dishes, El Olivo Steak House and Mizu, serving Exquisite Japanese Cuisine. Clover Irish Golf Tavern and the Club House Bar serve refreshments for golfers. The Boulevard at Mar Menor Village offers additional restaurants, nightlife and a supermarket just a short stroll from the hotel. The large outside hotel swimming pool (available in summer months) and sunbathing areas are perfect for relaxing in the sun. 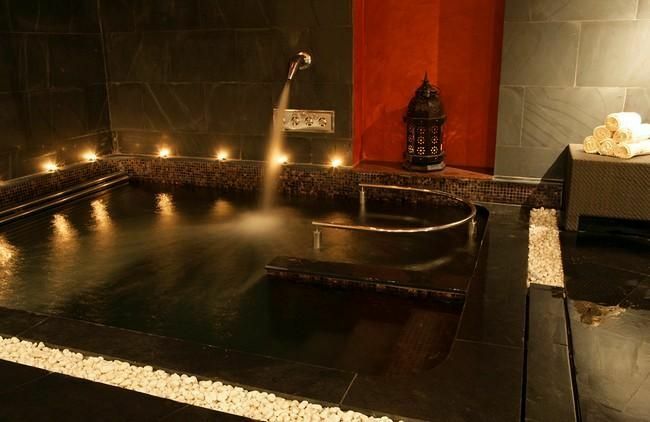 Guests at the InterContinental Hotel also enjoy 1 Free Spa entry per stay, offering revitalizing & indoor swimming pools, sauna/steam room, relaxation and fitness room. Listed Golf Package prices at InterContinental Mar Menor include daily breakfast at the Clubhouse. Upgrade to Half Board with the following choice of evening dining. • MIZU Sushi Restaurant - NEW JAPANESE RESTAURANT. Offer Conditions: Booking Terms: Supplement payable per person per night for Fontana Di Pietra & AGNI. Surcharge of €5 per night payable for Nomad and Mizu Restaurants. 3-Course evening meal included. Drinks not included. Listed golf package prices at InterContinental Mar Menor already include a 10% Early Booking Discount for booking 60 days in advance. Offer Conditions: A supplement may apply for late booking. Listed Package Prices: Listed golf package prices apply for bookings made at least 60 days in advance. - PGA Pro FREE on the same basis, single occupancy of 1-bedroom apartment. Single supplement, extended stays available on request. Groups of 8+ receive Free Airport & Golf Transfers & Half Board at InterContinental Mar Menor. Offer Conditions: Group Offer may not be combined with any further Group Discount. Listed Package Prices: Listed golf package prices apply with Group Offer. Standard Room (34m²) Spacious rooms all enjoy balconies overlooking the golf course, with large marble bathrooms offering twin washbasins, separate walk-in shower and hydro massage bath. Luxury styling creates an intimate atmosphere and each room is equipped with the latest technology. Executive Club Level (34m²) All executive rooms offer balcony views overlooking the pool. Suite (55m²) Decorated in an exclusive chic style to create an intimate and relaxing environment, all suites incorporate the latest technology; have a large terrace with exceptional views, separate seating area and luxurious bathrooms with walk-in shower and hydro massage bath. turndown service, satellite TV, in room movies, mini bar and high-speed internet access. Nomad restaurant – The main restaurant, for breakfast it offers an exquisite Spanish buffet. In the evening Nomad offers a rich menu of Mediterranean and fresh products, to enjoy the most elaborated Murcian traditional cuisine. Enjoy the new rice menu with seven delicious traditional Spanish rice dishes and three starters selected by the Chef. La Fontana di Pietra - offers the most exceptional traditional cuisine menu. Enjoy a great variety of delicious pasta and delicious pizzas oven cooked. El Olivo – Offers the original bistro style for lunch, snacks and Dinners on the terrace. Fantastic barbacue Dinners, and unforgetable moments in summer. Mizu - Exquisite Japanese Cuisine in an exclusive environment oriental Spa. The most exclusive and minimalist restaurant. You will enjoy the Fusion Japanese creations from the most qualified chefs. The Clover Irish Golf Tavern - bringing the game’s history and tradition to life in a pub-style setting adorned with golf paintings, illustrations, cartoons and tournament posters. Draught Guinness, Murphy’s Irish Stout, draught lager and bottled international beers and ciders are teed up with a bar menu of burgers, sandwiches and salads. Five plasma screens ensure you won’t miss a minute of major national and international sporting events. Live music is provided every Thursday night. Golf Club House Bar - situated between the first and last tees, the ideal venue for cool drinks and light fare any time of day. Golfers love to gather at the crescent-shaped bar to replay their finest shots! A roomy open-air terrace with views of the golf course and the pool is an inviting option for a post-swim snack, afternoon pick-me-up or evening cocktails. A fully-equipped fitness centre is on-site with personal trainers available to offer tailored programmes to guests. In addition guests can enjoy indoor and outdoor pools and a tennis court. The excellent golf academy has a practice putting green and driving range available for the use of guests. The nearby historic port of Cartagena and the region's capital Murcia offer tourists a great taste of the Spanish cafe culture as well as excellent shops and restaurants with a rich cultural heritage. Both Cartagena and Murcia have ruins dating back thousands of years plus a range of architectural delights including medieval, baroque and gothic. Main attractions in Cartagena include the remains of the Punic Rampart (built in 227BC) and the recently restored Roman Theatre of Carthago Nova. There are also many military attractions such as the Peral Submarine which sits on the promenade. Murcia's main attractions include Cathedral of the Diocese of Cartagena, which has gothic, baroque and renaissance sections, the bell pavilion and the colourful Bishop's Palace. ESPA Spa at InterContinental Mar Menor Golf Resort and Spa is the perfect place for guests to unwind with the delicate aroma of essential oils and deep sense of calm. 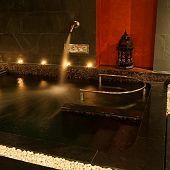 Spa journeys begin with the restorative benefits of the thermal suite and continue into the tranquil relaxation room. Every ESPA therapy is totally personalised for the ultimate in luxury with a range of treatments from professionally trained staff. For further details on the ESPA at InterContinental Mar Menor Golf Resort and Spa, please ask your Ascot Golf Sales Agent, or to ensure availability at the Spa for your visit to InterContinental Mar Menor Golf Resort and Spa, please include your Spa preferences with your Ascot Golf Holiday Booking. Mar Menor is a stunningly attractive layout set within a Mediterranean landscape of lush vegetation and palm trees. The course was originally designed as nine holes by renowned architect Dave Thomas then extended to 18 by the great Jack Nicklaus. Both halves have their own character with the Thomas-designed nine winding through beautiful properties and Nicklaus' half presenting many water hazards and bunkers. Mar Menor demands a good deal of shotmaking, but the soft contours of the land ensure it is not too tricky for the average player with plenty of recovery areas. Saurines de La Torre Golf is a spectacular, desert-style course modelled on Jack Nicklaus’ designs in Las Vegas. Nicklaus has placed the greens in challenging but attractive sites between sand dunes. There are not many bunkers but a six-acre lake runs throughout the course. The water is well in play on the 18th, providing for a spectacular finish. 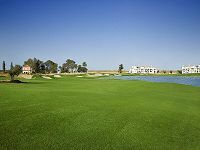 Alhama is the furthest inland and probably the finest of the Nicklaus courses in Murcia. The course is hilly with undulating greens, five great lakes and plenty of fairway bunkers. Alhama is a big challenge for any player, at any level because of the perfectly calculated design forcing you to think carefully for every shot. Signature hole is the unusual eighth – a classic risk-and-reward hole where the tee shot is played to a wide but shallow fairway that is littered with bunkers. 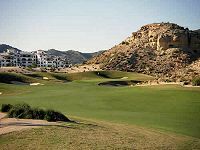 El Valle GC is set in the backdrop of the Murcian Mountains and within a beautiful natural desert valley. The golf course groups several holes together while keeping the surrounding development on the perimeter. This means many holes border other golf holes and not houses, creating a more open and natural golf experience. Rather than length, the course relies on numerous subtle strategic elements with clusters of subtle bunkering to challenge golfers. This course puts a premium on accuracy, not power, and favours the intelligent player who can manage his or her game. Visitors to Intercontinental La Torre enjoy complimentary transfers to El Valle. 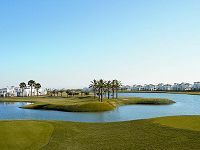 Hacienda Riquelme GC is a modern Championship course which features the new paspalum grass – similar to Bermuda, with excellent putting surfaces. The course layout offers ample fairways that are combined with challenging greens, and bunkers ready to complicate your round! All of which is surrounded by wild flowers, olive trees, large lakes and an abundance of history. The course has a very links-like feel to it in places and the rough-cut bunkers add to this. Another pleasing aspect to the layout is how the properties have been set back from the course itself and at no time do they feel as if they are encroaching on your game. Many of the yardages of the greens are quite deceptive as many of them are slightly elevated and heavily protected by bunkers so as a general word of advice take a club more than you think! 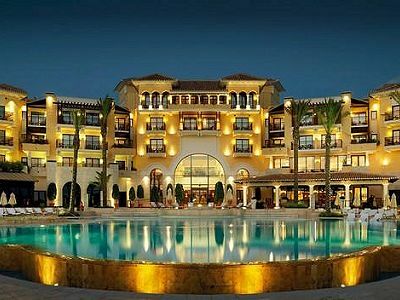 Visitors to Intercontinental La Torre enjoy complimentary transfers to Hacienda Riquelme. La Torre features 6 par-3's including the 17th with a155 metres carry over water, plus 2 Par 5's, both of 450 metres. Accuracy is required for the par 4's so keep which may reward keeping the driver in your bag! The greens are typically in excellent condition, undulating and quite fast! Golf Option: Golfers may choose any combination of the 6 golf courses listed for each golf package.